Our journey through St. Louis City Preservation Rights is coming to an end, and with the final attorneys’ bill in hand, we’re throwing a party to pay that down and celebrate a small victory. The story began with trying to save the San Luis from demolition. It came down. The reasons it came down seemed in violation of laws already on the books, so we took it to court. The judge said we had no standing to protest this. Because this was a gross misunderstanding of the laws already on the books, and because this ruling put future buildings in the same jeopardy, we took the case to the next highest court. Here’s a news report of what went down in court the first week of May. We’re waiting for the final written judgment, but our group who filed the suit – and our attorneys – are pleased with the tone of argument in court on that day, so we’re closing up shop on this particular preservation adventure. And we’re feeling good about the safety of the rights of St. Louisans to protect worthy buildings from bad decisions. 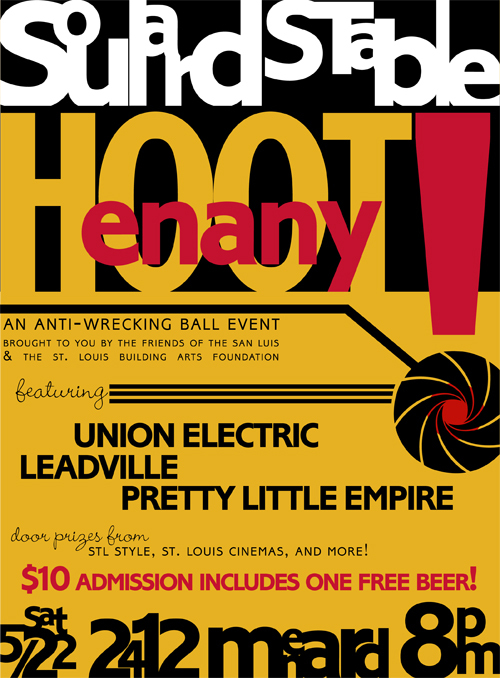 The Anti-Wrecking Ball crew would love for you to join us on Saturday, May 22, 2010 from 8 p.m. – 1 a.m. at the historic Stahl Stables in Soulard for some music, mirth, raffle prizes and beer! There will be cash kegs of Schlafly to drink from after you finish the complimentary brew, along with some raffle prizes and special features that are still being firmed up as we type. 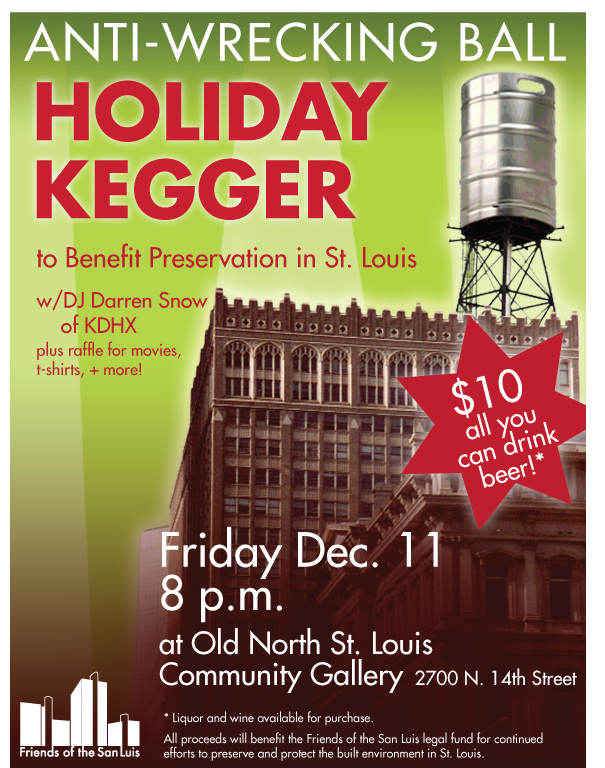 All proceeds go to our noble and benevolent lawyers and the St. Louis Building Arts Foundation. 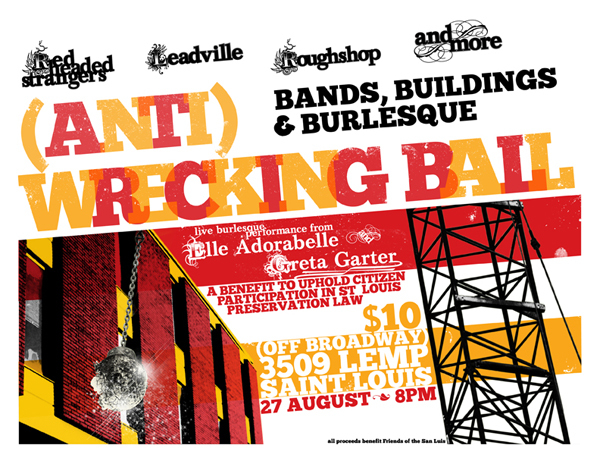 So we can all get tipsy and rock out knowing we’ve all done our small part to protect our rights and the next building threatened by a wrecking ball. If you’re on Facebook, here’s the official invite. And click here for even more information. The Anti-Wrecking Ball Holiday Kegger was a qualified success. Success is measured by how many kegs were emptied (2) and how much of our lawyer fees were paid down (most of it!). Thank you to every single person who came out to the inaugural event at the Old North St. Louis Community Gallery (gorgeous space in the most optimistic part of town) and for each person who contributed time, talent, booze and money to our adventures in preservation law. You can see a goodly number of these lovely people in these event photos. And here’s a brief video of the evening. And as our adventure continues, you can donate at any time through the Friends of San Luis Pay Pal account. The San Luis is toast, but what about the next building? Our quest to clarify St. Louis City preservation laws – and assure that those laws apply to everyone – continues. As we move this legal argument to the Missouri Court of Appeals, our tenacious lawyers need to get paid. So we’re putting on a show to raise money. 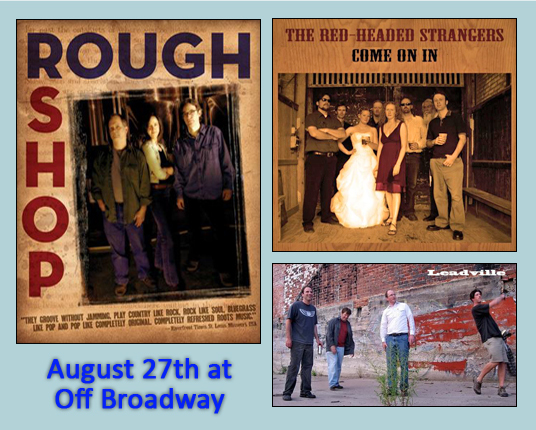 Off Broadway (thanks to Kit Kellison for supporting the effort and donating the club for the night) opens its doors at 7:30, and it all begins at 8 PM with Elle Adorabelle and Greta Garter performing before and after each band set. Leadville kicks off the music, followed by The Red-Headed Strangers and Rough Shop. 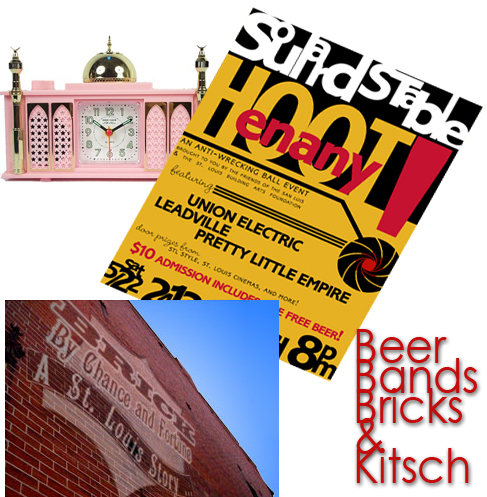 While the stage is popping, enter a raffle to win from a fine selection of StL – Style merchandise. It’s $10 at the door, and every cent collected that night goes to the Friends of the San Luis, LLC legal fund. We would much rather you come and party in person, but if you can’t and still support the effort, we gratefully accept donations through Pay Pal.